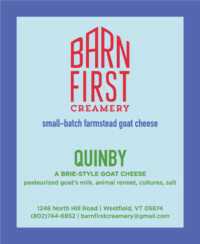 Thirty two goats (plus some boys) in a barn, two humans in the cheese room, lots of wheels in the cave! Pasteurized goat’s milk, animal rennet, cultures, salt, vegetable ash. Pasturized goat’s milk, animal rennet, cultures, salt. Raw goat’s milk, animal rennet, cultures, salt, annatto. Pasturized goat’s milk, animal rennet, cultures, salt, vegetable ash.